Patrick Payne is likely to send Widgee Turf (r) to Adelaide rather than race him in the G1 Memsie. The strength of entries for the Group One Memsie Stakes at Caulfield has trainer Patrick Payne looking elsewhere with the consistent Widgee Turf. The five-year-old holds nominations for two races at Caulfield on Saturday including the $1 million Memsie Stakes but the Listed Penny Edition Stakes (1400m) in Adelaide on the same day looms as Payne’s race of choice. 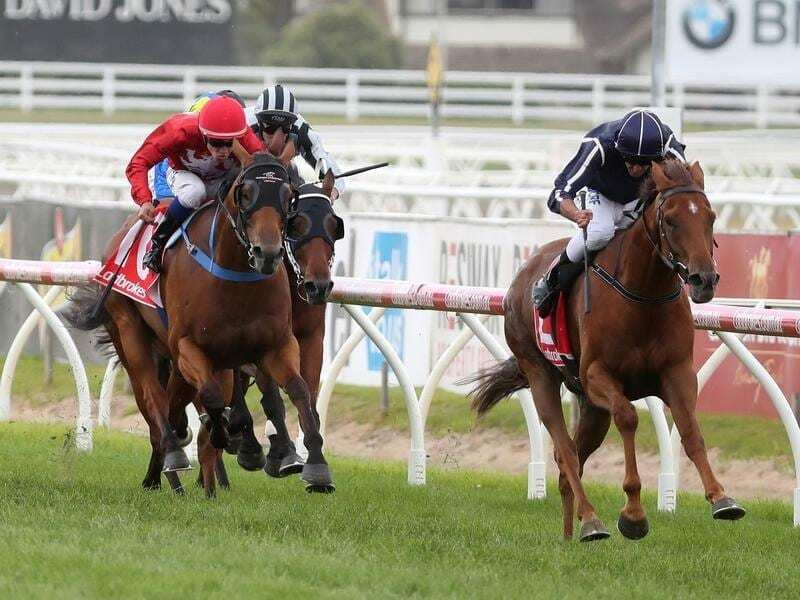 Widgee Turf stepped up to weight-for-age company in the Group Two P B Lawrence Stakes (1400m) at Caulfield last Saturday week and acquitted himself well, finishing strongly for a close third to Showtime and Hartnell. The Memsie field is expected to be headlined by defending champion Vega Magic along with other Group One winners including Happy Clapper and Kementari. “I think he should go to the Penny Edition in Adelaide,” Payne said. Payne said local jockey Todd Pannell had been booked for Widgee Turf in Saturday’s $100,000 weight-for-age Penny Edition (1400m). “There looks like a bit of rain over in Adelaide and the race looks more suitable for him,” Payne said. Acceptances for the Caulfield and Morphettville Parks meetings are taken on Wednesday. Vega Magic was the $2.70 favourite on Tuesday in the TAB’s all-in market for Saturday’s weight-for-age Memsie (1400m) which is Melbourne’s first Group One race of the season. Kementari was at $5.50 with Happy Clapper, winner of three Group One races last season, at $6.50. Caulfield Cup favourite Kings Will Dream, who turned in an eye-catching performance for fourth in the Lawrence Stakes first-up, was at $9.50.